Now a days Laptops are essential devices for official or personal use. There are laptops for engineering students, architecture students and MBA students, business and gaming laptops available online at No Cost EMI and long term EMI with some interest. For Laptops No Cost EMI there are some different rules, as listed below. Only Selected bank’s credit cards from Axis Bank, Citibank, HDFC Bank, ICICI Bank ,State Bank of India provides No Cost EMI on laptops. Most popular and preferred brands like HP, Lenovo, Dell are available online on Flipkart. For process of No Cost EMI is the almost same as regular EMI, only change is the down payment options. On the products details page identify if laptop available on No Cost EMI or Not. See below Image. For this example we have selected Lenovo Ideapad IP 320S-14IKB with price ₹49,990. 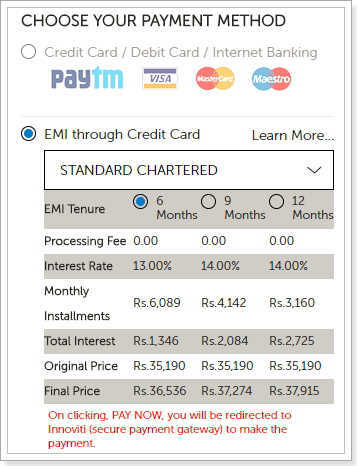 In the details window you can view your credit card’s No Cost EMI option with details what will be your Installments for the Laptops as shown below. 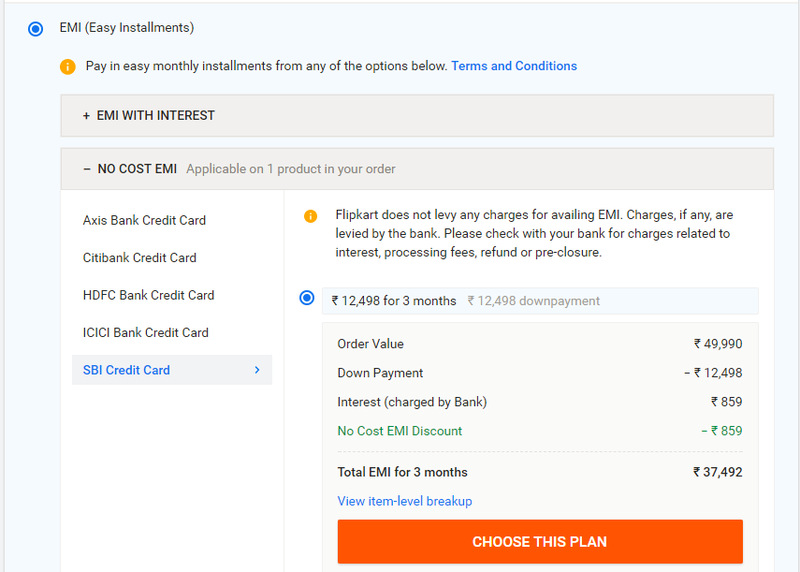 On Amazon India there is No Down Payment , you can confirm No Cost EMI offer on Amazon in “Special offers and product promotions” sections. Add your laptop to the cart and checkout then provide details like Login, and delivery address. 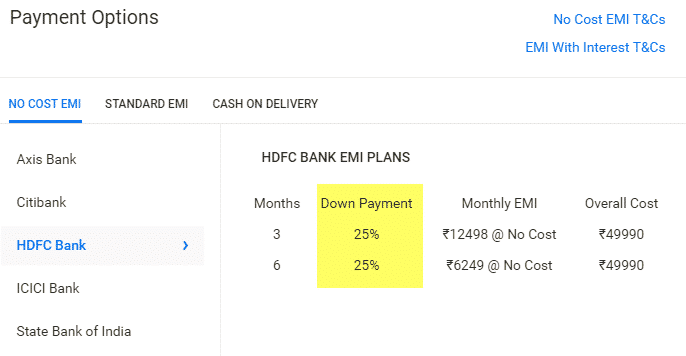 In the Payments options select EMI (Easy Installments) click on No Cost EMI tab and you will able to view the details break up of No Cost EMI discount and down payment. 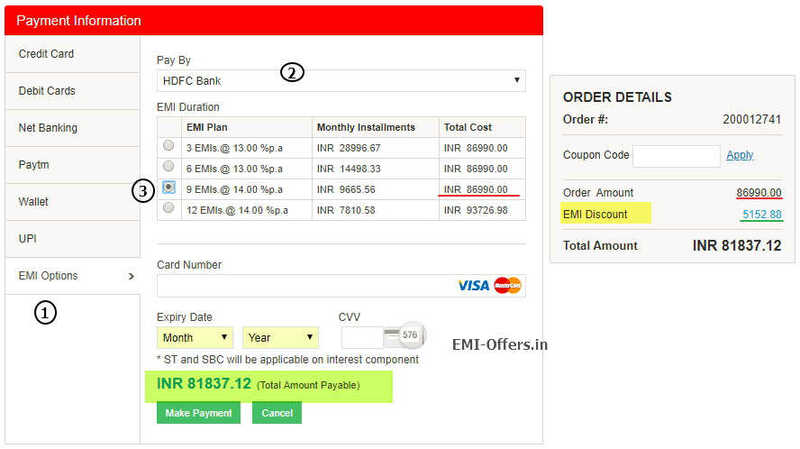 Note that down payment and EMI will be charged from same credit card you select. In above case ₹ 37,492 will be converted to EMI which can be paid installment of ₹12498 for 3 months or ₹6249 for 6 months. In travel and business laptops wight and easy of use is important for laptops and best in this class is Apple Macbook Air with 4.7 ratings out 5 other light and convertible includes lenovo yoga series both Macbook Air and Lenovo Yoga are available on No Cost EMI from banks credit cards mentioned above. Gaming laptops are costly compared to other laptops as for Gaming purpose dedicated graphic card required and some gaming laptops have SSD plus HDD. Almost all the gaming laptops are available on No Cost EMI with downpayment of 25% of product price. Lenovo Legion, MSI , Alienware , Acer Nitro and HP 5000 are best seller laptops with No Cost EMI and regular EMI. HP Laptops are available on No Cost EMI and Bajaj Finance card ,CashCare and Credit cards. For Official HP Online stores there is No Down Payment Required as we have seen in earlier steps. 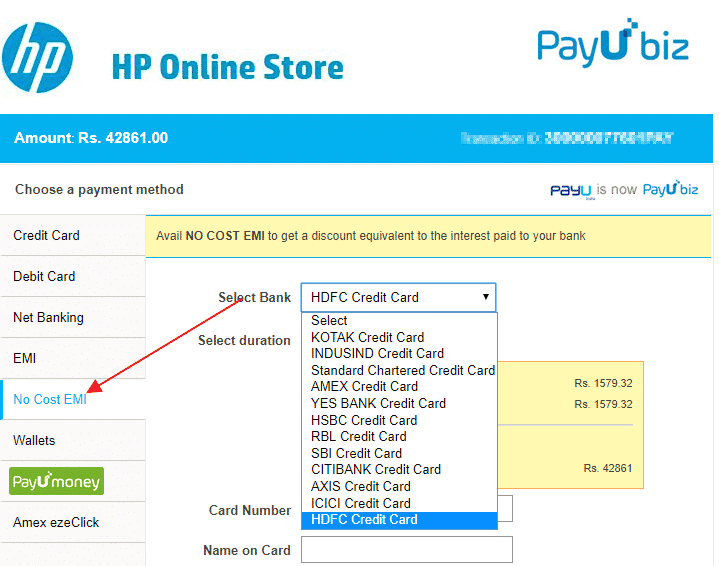 For Bajaj Finserv and Cashcare is only available at official hp online store , you can check at the time of the payment. HP Envy laptops are premium design and high performance laptop starts from ₹44,990 from Flipkart but as mentioned earlier there will be 25% down payment and only selected credit cards available for this No Cost EMI and Bajaj EMI not available as of now. With NVIDIA GeForce GTX 1050M GPU, the HP Omen gaming laptop offers a power-packed performance. Its Dragon Red backlit keyboard will help you keep playing, even after the lights are switched off for the night. HP Omen Gaming Laptops No Cost EMIs from ₹10,284/month with 25% Down Payment and Regular EMI Available from ₹2,812. Lenovo Laptops offers wide varieties from educational laptop to enterprise level ThinkPad. Official online store of Lenovo provides EMI options available from HDFC, Citibank, American Express, Axis Bank, Central Bank of India, Corporation Bank, HSBC Bank, ICICI Bank, IndusInd Bank, Kotak Mahindra Bank, RBL Bank, Standard Chartered Bank. No Cost EMI available on all products above Rs. 40000 for 3, 6 and 9 months. on Official Website of Lenovo Store. 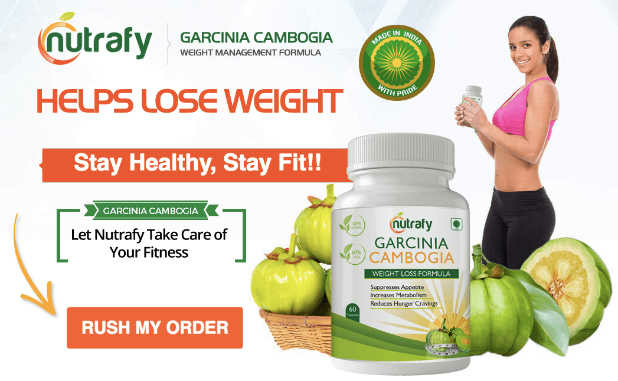 Select your product and at the checkout and at the Payment method choose CCAvenue. 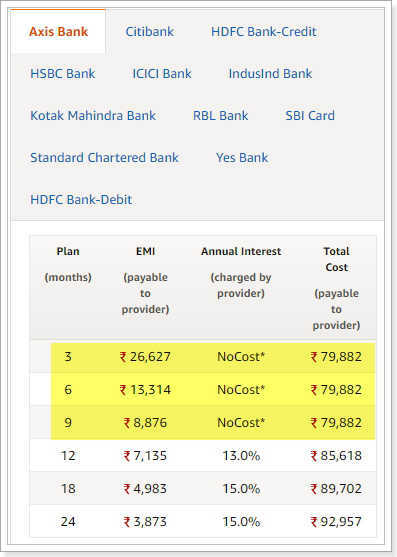 On the Payment page click on EMI (1) , then select Pay By with your credit card Bank, and you can select upto 9 months no Cost EMI (3). Finally enter your card Details and proceed with payment. 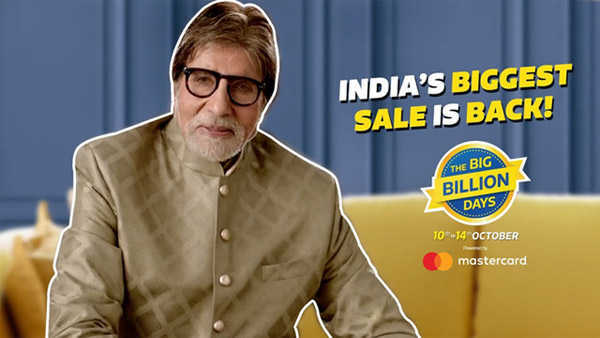 Advantage of using No Cost EMI on official store, there is no Down Payment required unlike Flipkart on which we have to pay 25% downpayment. Dell laptops have wide rang of varieties from XPS , Alienware and Vostro. This offer is valid on select Inspiron Laptops, Desktops, All-in-One, XPS Laptops, Alienware (Laptops & Desktops) & Vostro. Step 2: If offer is available add to card and checkout, note that Cart value will show the total amount without any discount. 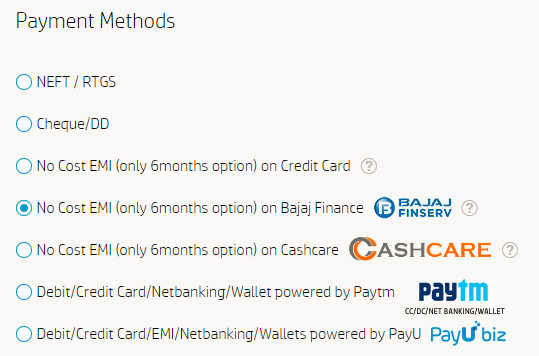 Step 3: In payment method choose “EMI Through Credit Card” , select your Credit Card and select 6 Months EMI tenure. Step 4: Proceed with card details and payment. unlike upfront discount on No Cost EMI. interest rate charged for 6 months will be refunded in maximum 90 days. 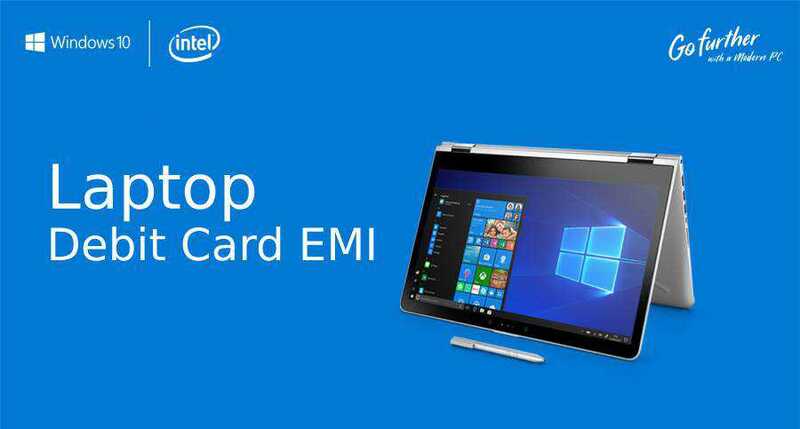 Only Selected Dell Laptops are available on No Cost EMI from Credit Card on Amazon India Site. No Cost EMI available on almost all the credit cards, there is No down payment, below is the example of Dell Inspiron 15 7000 with 9 months No Cost EMI. Only selected Apple MacBooks are available on No Cost EMI from Online stores, there are different down payment options and interest rate for Apple macbook, below example show EMI table for Macbook Air 13 inch version. On Offline stores you can get Apple Student Discount , but comparatively its low. Acer laptops are available on No Cost EMI with small downpayment of 25% and rest of the amount will be converted to 0% EMI. Acer laptops offer variety of laptops categories like ultra-thin, convertible, everyday use laptops and gaming laptops Nitro.